Margarita Machine Rentals in Las Vegas - Rent Margarita and Slushy machines in Las Vegas and other cities. 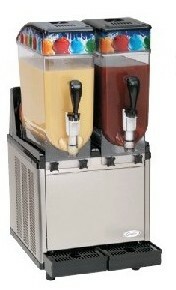 Rent a margarita or frozen drink machine at a great price! One and two reservoir units available, singly or in combination. Rent by the day or by the week. Either style works great for margaritas, mocktails (alcohol free), piña coladas, daiquiris, mai tais, and any other frozen slushy drink you may want or can think of. $190 per tank per day. For larger volume rentals request a quote. Unfortunately, lengthy delays in deliveries and pick-ups force us to charge higher rates for trade shows and conventions. For my own (stolen) Margarita Especial recipe, the envy of the southwest, and a few other recipes for making esoteric margaritas and daiquiris, click here. If you can plug in an electrical cord, push a switch, and pull a handle, you can operate one of these easy-to-use machines. call (702) 338-4091 or email to margarita rentals. If you want to read the rental contract, click on the link.